This hilarious science-fiction comedy novel follows the first case for Noomi Rapier, rookie investigator with The Transdimensional Authority - the organisation that regulates travel between dimensions. When a dead body is found slumped over a modified transdimensional machine, Noomi and her more experienced partner, Crash Chumley, must find the dead man's accomplices and discover what they were doing with the technology. Their investigation leads them to a variety of realities where Noomi comes face-to-face with four very different incarnations of herself, forcing her to consider how the choices she makes and the circumstances into which she is born determine who she is. Ira Nayman's new novel is both an hilarious romp through multiple dimensions in a variety of alternate realities, and a gentle satire on fate, ambition and expectation. 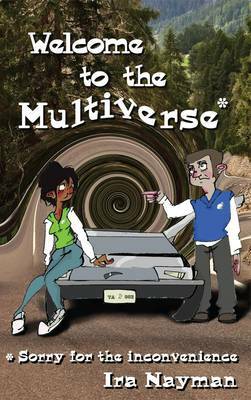 Welcome to the Multiverse (Sorry for the Inconvenience) will appeal to comedy fans who have been bereft of much good science-fiction fare these last eleven years. Ira's style is at times surreal, even off-the-wall, with the humour flying at you from unexpected angles; he describes it as fractal humour. Anyone who has read his Alternate Reality News Service stories will know how funny Ira is. The characters we meet from around the multiverse deserve to become firm favourites with all fans of science fiction comedy.